Looking for a simple yet secure solution to exchange large files? 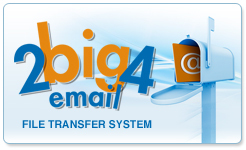 Try the eSolutionsGroup 2big4email File Transfer System. Provide an subject and message to be included in the system generated notification Email. The link will allow you and your recipients to come to the site and download the file to their computers. As the sender, you will receive an automatic notice of delivery and a reminder of your file expiry date.